In college I made it to the Henry Vilas Zoo a couple times a year and always wanted to try the cute cafe just across the street from the main entrance. During warm months the large amount of outdoor seating seemed to welcome neighbors, but the colorful building was also quaint and welcoming on cold fall afternoons. 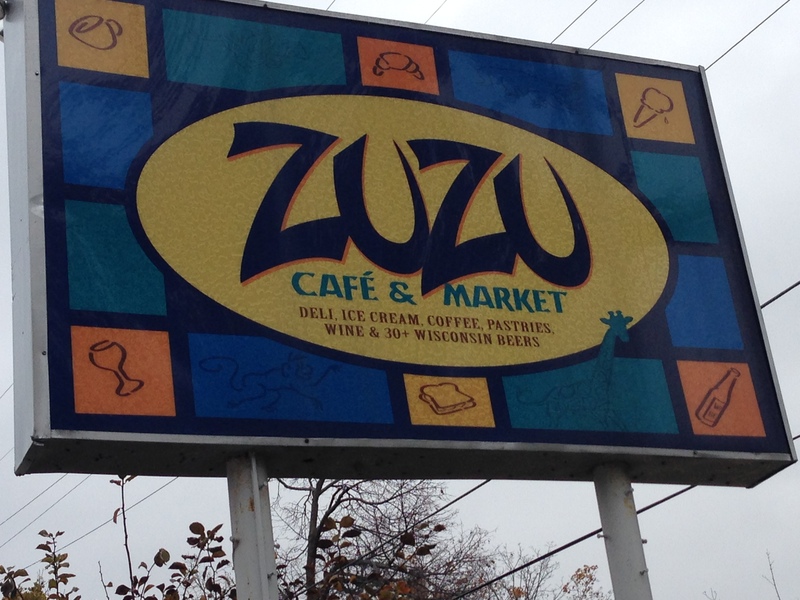 ZuZu Cafe and Market seems like a slightly misleading name because to me, a market sells food, goods, drinks…I usually associate a cafe and market with artisan cheeses, micro brews, baked goods and locally made products. This is definitely a cafe, but the market (as far as I could see) only sells beer. The dining room is open and bright, and is very child friendly (it has kid tables and chairs, and a play area). I feel like the entire cafe could use a little facelift (the displays could be updated, most of the signs are handwritten and posted with peeling tape, and everything seemed like it could use a new coat of paint or a good cleaning). 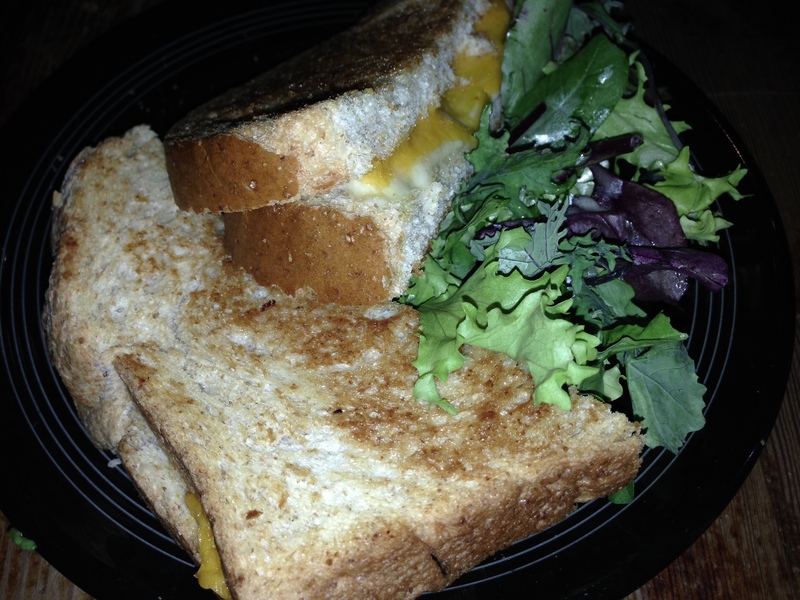 The menu options basically include sandwiches, soups, salads and a small selection of baked goods. They also have what appeared to be a full-service coffee bar. 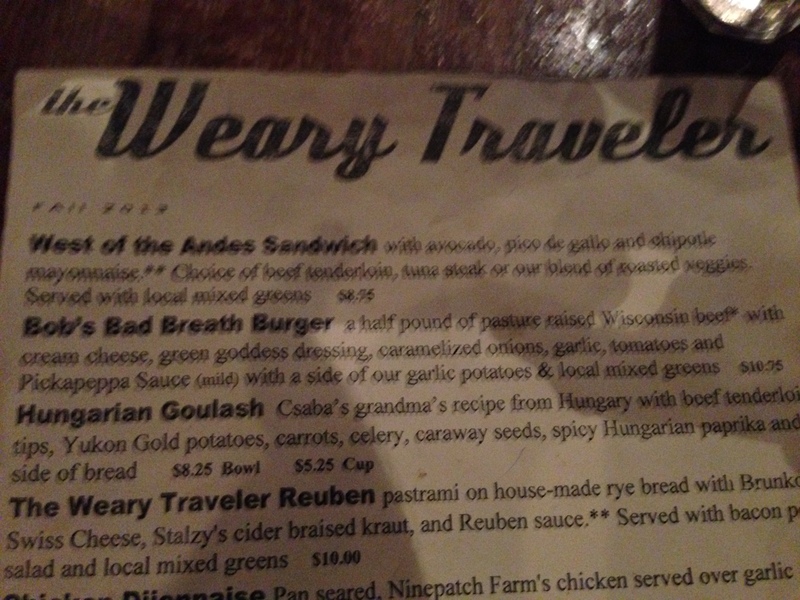 All of the sandwiches have local names like the Wingra, the Randall, the Henry and the Vilas. 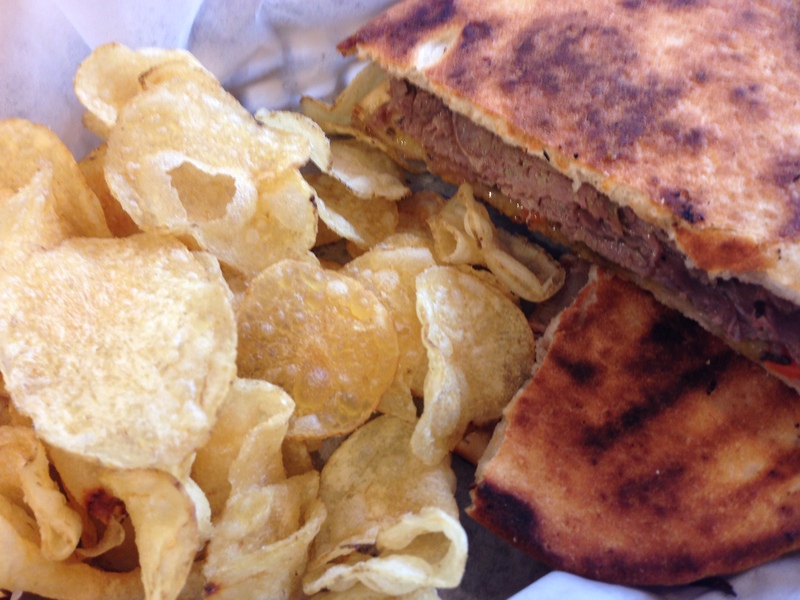 I got the Jefferson panini with marinated roast beef, italian relish and mozzarella cheese. I didn’t see a bread option listed anywhere so I was pleasantly surprised to have my panini arrive on sliced pita. The pita made for a sturdy but not heavy sandwich ingredient. My panini was obviously fresh because it was very crispy and steaming hot. The marinated beef in the sandwich was tangy and slightly spicy! It was tender, juicy and had a very good flavor. Ironically, I’ve made this type of marinated beef in my crockpot and it is super simple. The sandwiches come with a side of chips, which is fine but I would prefer a choice of a small salad instead of the chips. Off to the side of the main counter there is a display of baked goods. 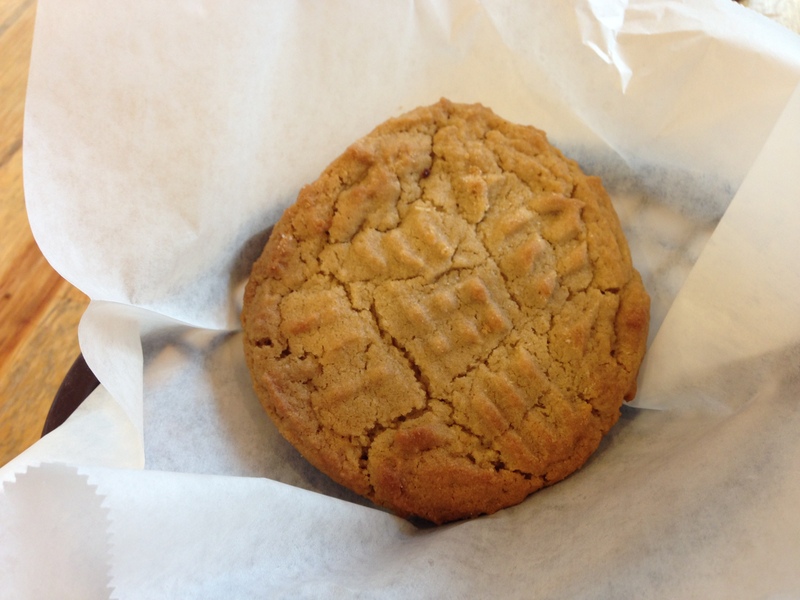 I’m not sure how fresh they are because they were all covered in plastic wrap, but I decided I wanted a peanut butter cookie. The cookie was good but nothing special. It was soft, chewy and had a good peanut butter flavor. FOODNOTES: One of the things that threw me off about the entire place is that the prices are equivalent to any other Madison cafe but everything about the place seemed a little cheap. The food was fine, nothing special, but it was all served in plastic carnival-food baskets. You know the ones – they are bright red basket-weaved plastic oval bowl things. Even my cookie was served in one, which didn’t work out too well because the cookie kept tipping the basket over. The walls, displays, seating and signs could all use a good cleaning and/or be updated. I was also disappointed in the “market” aspect they advertise on their sign. I didn’t have coffee so I can’t vouch for or against it. I can confidently say I have never had authentic Mexican food. I can also confidently say that based on what I know about authentic Mexican food I will probably love it. While I like the Americanized version of Mexican food that is so prevalent in Madison, I have been on a quest for something close to authentic for quite a while. I read a couple reviews on La Mestiza that said it was authentic and one of the best Mexican restaurants in Madison. Even though it lives in an aging strip mall, people have said it is amazing. I went with a friend for lunch, and the small dining room with a dozen tables and a small corner bar in the back was half full and pretty inviting. Even though one waitress was seating and waiting on everyone, the service was fast and friendly. 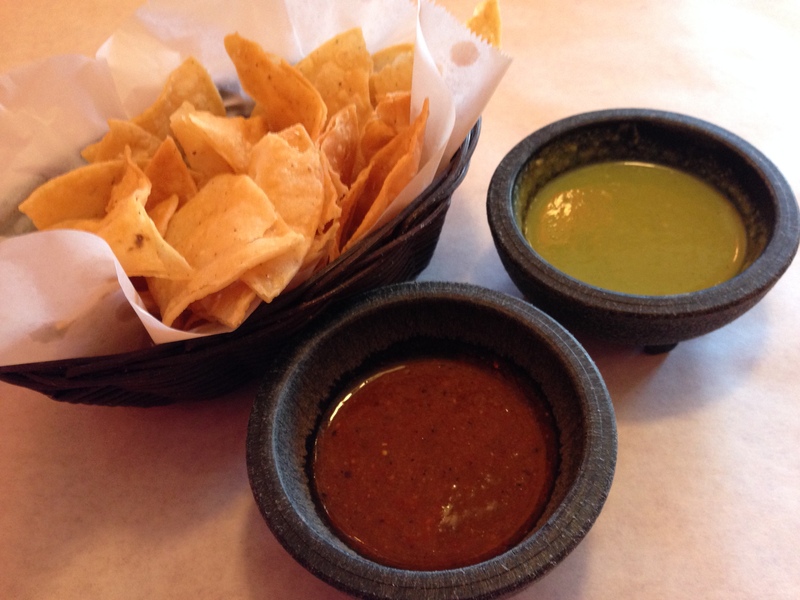 We got chips and two types of salsa before ordering. The chips were very crispy and extremely fresh. The red salsa was smoky but didn’t have a lot of other flavor (I was hoping for some spiciness). The green salsa was tangier, and tasted like tamatillos and cilantro. Neither of the salsas impressed me, but the guacamole we ordered was fantastic. It was definitely the highlight of the lunch. It was perfectly chunky, fresh and had an amazing flavor. I’m not sure what made it so good, but I could eat that guacamole every day. 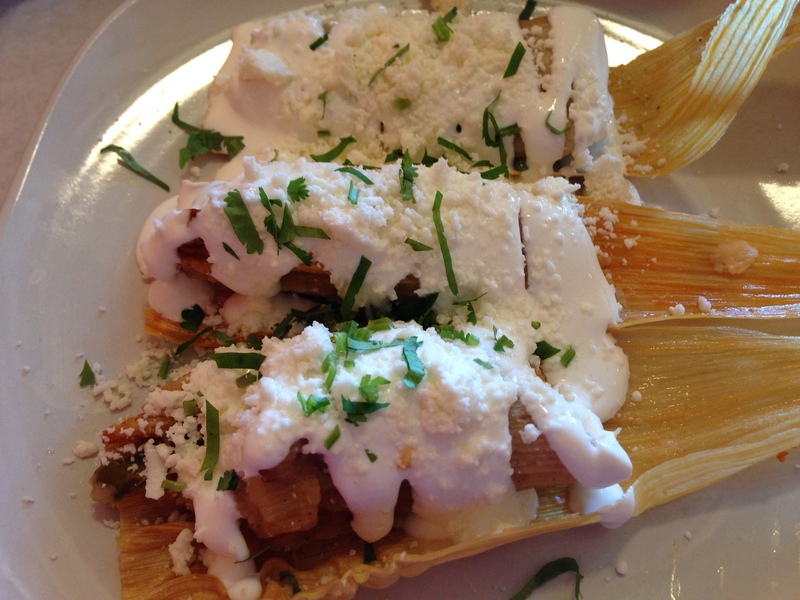 I was excited about ordering the tamales because usually a plate of tamales is one flavor (generally shredded pork), and at La Mestiza the order comes with a chicken, pork and cheese tamale. My excitement was dashed when my tamales came out covered in a white sauce and were dry, kind of tasteless and had no heat at all. I was expecting the tamales to be covered in a spicy red sauce and come out steamy with flavorful fillings. The best part of my lunch was that the serving of guacamole was so big there was enough left over to eat with my tamales. 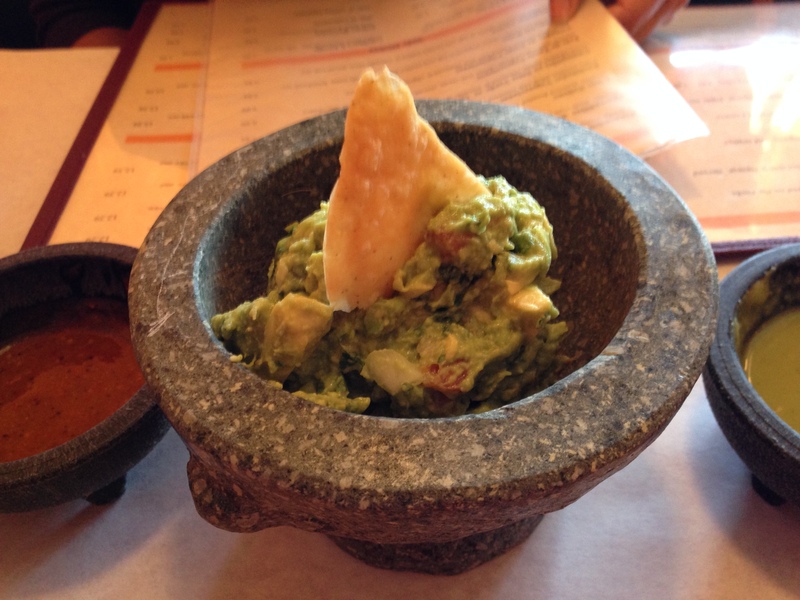 FOODNOTES: I would consider going back to La Mestiza specifically to have the guacamole again. Maybe another one of the dishes on the menu would be better than the tamales (which I can only assume were dry because they are cooked ahead of time and reheated). The prices are very reasonable but most of the dishes don’t come with rice or beans, so you have to order and pay for them separately. The chips were very fresh but could have used a little salt, and the two salsas that came with the chips were mostly flavorless and disappointing. I was hoping for fresh spicy authentic Mexican food at La Mestiza, but I got bland food with fresh guacamole and chips, and probably reheated tamales. I guess my quest for authentic Mexican food continues. Please post suggestions for authentic Mexican restaurants in Madison!!! Holy Manna that was good! 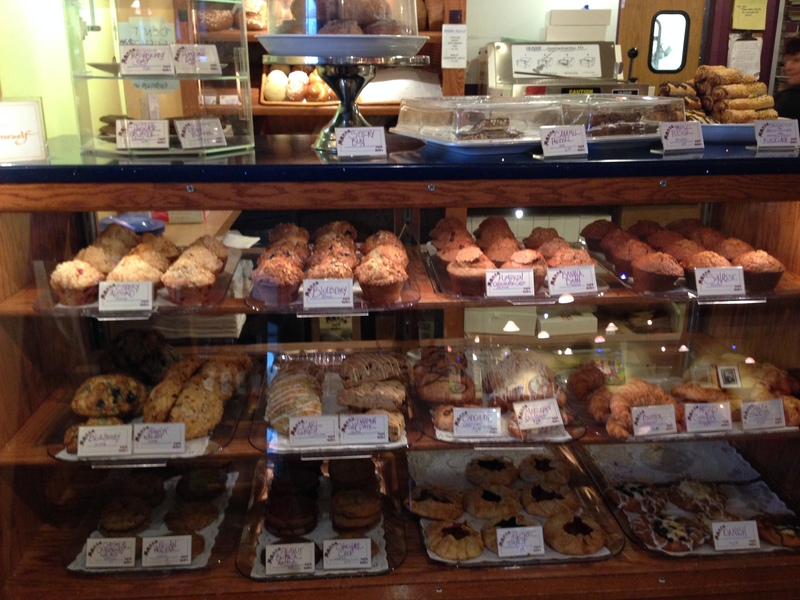 Manna Cafe on Madison’s north side is one of the best-kept secrets in Madison. It is hidden in the corner of a disheveled strip mall amidst an aging shoe-repair shop, travel agent and butcher shop. If I wasn’t expecting to pull into an old strip mall to find Manna I would have driven past it. But any sense of that strip mall disappears when you walk into Manna and are greeted by a beautiful pastry case, cheery yellow walls and a great menu. When we were there on a week-day morning both of the decent-sized dining rooms were full, and we were lucky to get a table! Even though I wanted to try most of the items in the bakery case I opted for one of the gluten free options since I’m trying to go mostly gluten free now. I got a pumpkin date bar with cream cheese frosting to take home. It was the perfect breakfast the next day. Gluten free desserts tend pretty dry because they have to use weird ingredients to avoid gluten, but this bar was great. It was moist and had a great pumpkin flavor. And the frosting was great! 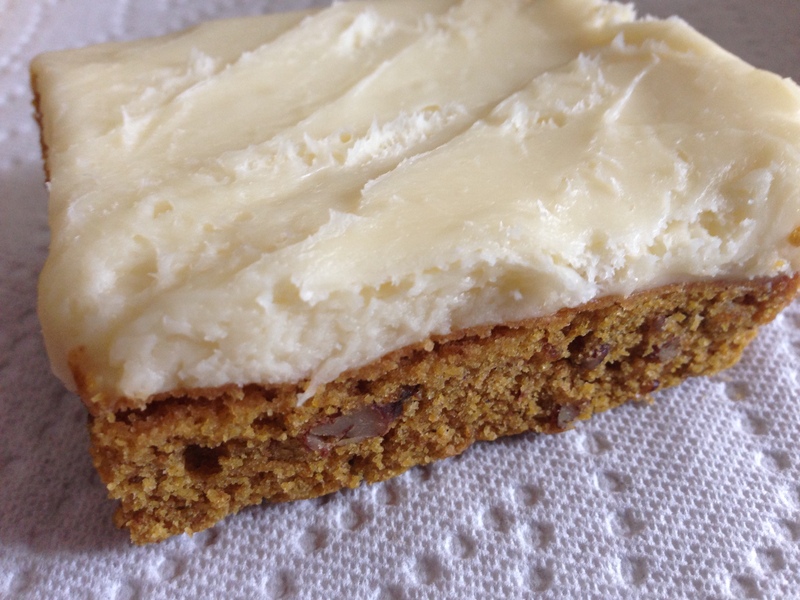 I loved that it wasn’t too sweet (which tends to be problem for regular pumpkin bars). For breakfast I got the A Walk-in-the Woods scramble with asparagus, mushrooms, cheddar cheese and frizzled onions on top. It was a good size with the perfect ratio of eggs to fillings. The frizzled onions on top added a great flavor and crunch. The scrambles come with some of the best breakfast potatoes I’ve had yet. They were seasoned really well and were amazingly crunchy on the outside, yet perfectly fluffy on the inside. Loved them! The scrambles also come with bread and I was pretty excited that they have homemade gluten free bread as an option! I was very happy with my breakfast. I was a little concerned about the coffee because it is served out of gas-station like serve-yourself carafes but it was hot, steamy, fresh and flavorful! The unlimited cup is definitely your best choice. My friend got the Sticky Bun French Toast and loved it, although it was a little rich with the chocolate maple syrup. 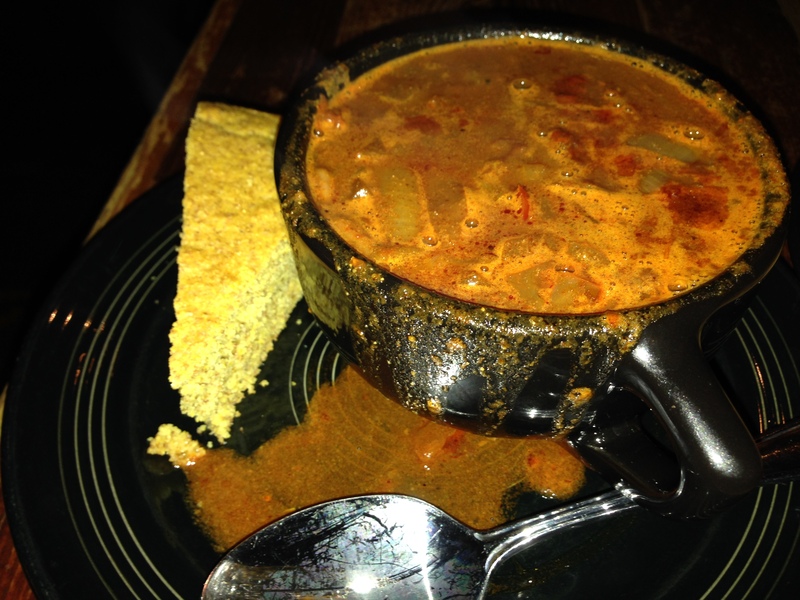 FOODNOTES: I was extremely impressed with the quality and quantity of food I got at Manna Cafe. The scramble was above the standard of most scrambles I’ve had, and the potatoes were memorable enough to bring me back for breakfast again. I loved my take-home gluten-free pumpkin bar, and can’t wait to try other seasonal gluten-free bakery options they will have. I really want to go back to try their oatmeal pancakes, the Okeefe benedict on the weekends looks super good, and a couple of the lunch options look really promising! 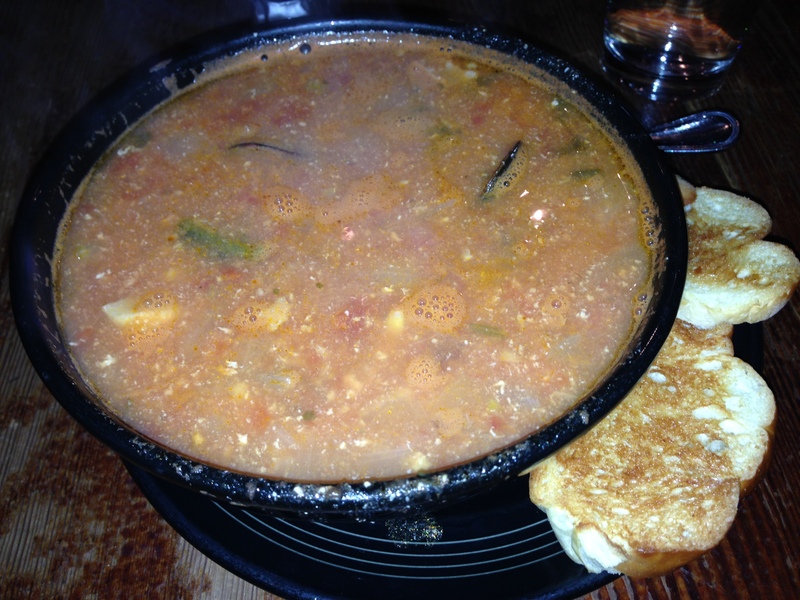 Their lunch menu is very extensive making it a very good option for groups of people. The prices were comparable to other cafes in Madison. And don’t let the unassuming location fool you, Manna Cafe is great!